Today marks the fifty-third anniversary of the end of the Algerian fight for independence. On March 19, 1962 the seven-year, four-month war ended after an official ceasefire was declared a day earlier in Évian, France, between the French government and Algeria’s National Liberation Front (FLN). "The third truth is that over the fighting, the attacks, the trials, despite all the differences of race, religion, and life that there are between Algeria and France, [there are] not only multiple connections woven over the hundred thirty-two years of their common existence; Not only the memories of the great battles where the children of the two countries fought side by side in our ranks for the freedom of the world, but a kind of special and elementary attraction that raises one up. If the struggle that is over and the sacrifice of the fallen dead on both sides will not have not helped in the end, the two groups of people must understand that they are made not to fight, but to walk together on the road of civilization." While the ceasefire announcement was the cause of celebration for Algerians, the French terrorist group, Organisation de l'armée secrete (OAS), attempted to sabotage the peace agreement, launching attacks for three months between the signing of the Évian agreement and the declaration of Algeria's independence on July 5. OAS called themselves counter-terrorists, repeatedly attacking FLN and even attempting to assassinate Charles de Gaulle in 1961. Amongst the organization's desperate acts to ignite a second seriesof violence were blowing up the University of Algiers' library, assassinating famous Algerian writer, Mouloud Feraoun, just three days before the official ceasefire, and raiding Algiers hospitals, killing ten patients and wounding others. Despite OAS's incitement, FLN refused to retaliate, maintaing their promise of a ceasefire. One month before Algeria finally declared independence, OAS agreed to a ceasefire between themselves and FLN. Six million Algerians cast their votes for Independence on July 1, 1962. On July 3, France officially recognized Algeria’s independence and Ahmed Ben Bella, of FLN, became the first president of the new nation. Two days later the Algerian government proclaimed July 5 would be Algeria’s official Independence Day, marking 132 years since the French originally invaded. Maqam Echahid (Martyrs’ Memorial) in Algiers, commemorating the heroes of the Algerian War. Image via Panoramio. Four years after the Algerians gained their independence, a film documenting the Algerian's struggle was released. Battle of Algiers is a critically celebrated film, considered one of the greatest cinematic achievements in history. The film was inspired by Saadi Yacef's book, Souvenirs de la Bataille d'Alger which were written in prison. Yacef was a member of the FLN and is currently a senator in Algeria's Council of the Nation. In November 2011, Warscapes had the opportunity to interview Yacef for the launch of the magazine in 2011. Aussaresses, on the other hand, defended the practice of torturing the Algerians, soldiers and suspected rebels. In his book, Services Spéciaux: Algérie 1955-1957 (known as The Battle of the Casbah: Terrorism and Counterterrorism in Algeria 1955-1957 in the English version) he recounts his exploits of torture in what could be called a gleeful manner. Aussaresses, and others, argued that torture was necessary for discovering attacks on the French and believed it would help them win the war. French satirical magazine, Charlie Hebdo, published a critical cartoon of General Aussaresses. It reads: "Yes, torture was necessary! Without it, we would have lost Algeria." The use of torture during the colonial war was not generally spoken about in the mainstream—despite reports from French journalists during the war—but became a hot topic after Le Monde published an interview with an FLN soldier in June of 2000. French paratroopers captured Louisette Ighilahriz, “Lila” (her nom de guerre), in 1957, when she was only twenty-years-old. She said she was raped and tortured severely, almost continuously, before a French military doctor rescued her after finding her in deplorable conditions. Ighilahriz told reporter Florence Beaugé, “Massu était brutal, infect. Bigeard n’était pas mieux, mais, le pire, c’était Graziani. Lui était innommable, c’était un pervers qui prenait plaisir à torturer. Ce n’était pas des êtres humains.” (“Massu was brutal, vile. Bigeard was not better, but the worst, was Graziani. He was unspeakable; he was a pervert who took pleasure in torture. They were not human beings.”) During the interview, Ighilahriz said her mother had suffered waterboarding and her youngest brother, a three-year-old, had been hanged. In the history of colonial wars, the Algerian war has been considered one of the most brutal. Over 500,000 Algerians died (though some believe it is closer to one million) and hundreds of thousands had been tortured during the course of the war. FLN executed tens of thousands of harkis, Algerian soldiers who fought alongside the French, after the war ended. The Franco-Algerian War had, and continues to have, a large impact on not only the soldiers, but also on literary minds. Countless poets, musicians, and authors have been influenced by the struggles either they or their fellow countrymen faced. While the French living in Algeria—the Pieds-Noirs (Black Feet)—were considered anti-independence, there were those who were for Algerian liberation. Jean Sénac, an Algerian Revolutionary poet, is one such Frenchman. Sénac wholeheartedly believed Algeria had the right to govern herself. He criticized French colonialism and the new Algerian military government in his poems, as well as writing about Algeria's culture, both before and after independence. He promoted French poets, writers, and artists in two of his literary journals—Soleil and Terrasses—as well as through poetry readings on Algerian radio. Sénac worked to bring together poets from all countries who rallied against oppression. Jean Sénac. Image via Warscapes. Algerian novelist and teacher, Mouloud Feraoun, generally wrote about the Berber way of life, as he himself was Kabyle. In his book, Journal, 1955-1962: Reflections on the French-Algerian War, he tackled the subject of Algerian life during the decolonization period. French ethnologist and member of the French resistance, Germaine Tillion, wrote: "This honest man, this good man, this man who never did wrong to anyone, who devoted his life to the public good, and who was one of the greatest writers in Algeria, has been murdered…Not by accident, not by mistake, but called by his name and killed with preference. "3 Feraoun held a unique position in Algeria as he identified with and taught in French, strongly identified as a Berber, and believed the Algerian rebels were a mirror image of French colonialism. He felt that both FLN and France employed tactics that terrorized Algerians citizens, but came to realize FLN was Algeria's only hope of achieving freedom. Mouloud Feraoun. Image via La Marseille. Algerian novelist and film-maker, Assia Djebar, has been criticized for her views on both the Algerian colonial and civil wars—the latter spanning a decade from 1992 to 2002. Benjamin Stora, a French historian born in French-Algeria, claims that "More than half of the novels by Algerian women come from the pen of Assia Djebar alone. "4 Stora writes that Djebar is one of two writers who "bring forth the voices of Algerian women." In her novels written after independence, Les enfants du nouveau monde (The Children of the New World) (1963) and Les alouettes naïves (The Naïve Larks) (1967), Djebar "celebrates the values conveyed by the war: heroism, devotion, abnegation. "5 The novels—the latter a sequel to Les Enfants—documents the Algerian women's contributions to the colonial war. Les Enfants is a chronicle of events that occur in an Algerian town, Blida, over the span of one day. While the novel does not document the fighting, readers experience the tragedies of war along with the characters—they see fires and the destruction that bombs have caused, as well as hearing stories of torture. 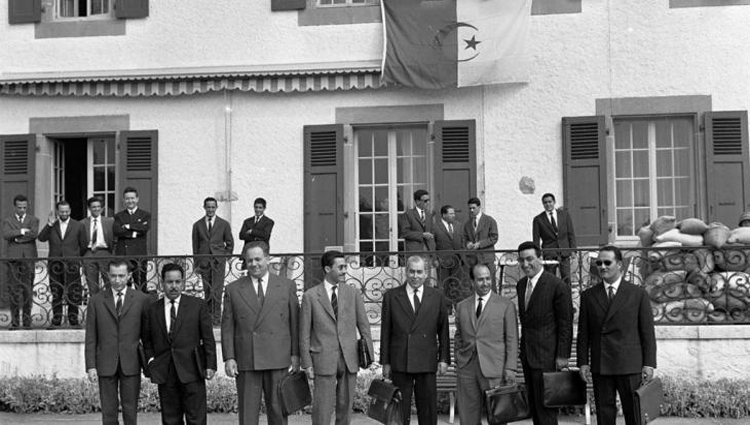 Djebar takes a look at the difficulties of differentiating between those for and against Algerian independence—people belonging both to Algeria and France. Djebar's sentiment would have been an unpopular opinion at the time as Algerians felt strongly about harkis and anyone who sympathized with France. Assia Djebar. Image via Liberation. Although Algerian Chaâbi singer, Dahmane El Harrachi, lived in France for the majority of the war, he wrote “Lazem Esmah Binatna” (“There Must Be Forgiveness Between Us”), a song reminding Algerians that they must unite as one and forgive the past. "The solidarity and brotherhood that we knew in the past must once again return; it will be the source of our future happiness. If we soften our hearts, our future will be brighter. Those who tried to divide us are the cause of all these conflicts and all this pain. What happened is done, let us forget what separates us and not provoke our enemies." Journal, 1955-1962: Reflections on the French-Algerian War. Mouloud Feraoun and James D. Le Sueur. Women's Writing Between Two Algerian Wars. Benjamin Stora. Asiya Haouchine is an intern at Warscapes. She is an English and Journalism major at the University of Connecticut.